When the Silberman School of Social Work at Hunter College (formerly the Hunter College School of Social Work) unveiled its new East Harlem home in 2011, the school was initiating a paradigm shift – a shift for this nationally ranked institution, and a shift for graduate-level public social work education in New York. Its programs and curriculum became nested in a state-of-the-art physical space that offers students the most advanced learning experiences. Its faculty grew, with dedicated young scholars joining seasoned global leaders, all eager to teach and engage in scholarship at Hunter. Its student body grew as well, reflecting its longstanding appeal as the most diverse and engaged school of social work in New York City. Very importantly, the school’s commitment to social justice and community empowerment gained new breath, and new breadth, in a location where classroom, community, city, and service are more deeply engrained with one another. The school’s name itself underwent a change, becoming the Lois V. and Samuel J. Silberman School of Social Work at Hunter College. The Silberman name, however, and its relationship to social work at Hunter, is anything but new. Like all the exciting developments that came with the school’s move northward, it is part of a larger story. That story is one of ongoing innovation in social welfare; responsive, community-driven growth; and undaunted commitment to serving the public. It is the story of an institution whose values, character, and impact have guided its success for more than sixty years, and an institution poised to enter its next chapter stronger than ever. Fine, Reva (1957). “Louis M. Rabinowitz School of Social Work,” in The Hunter College Alumni News 62 (1): 2. Pictured: Dr. Paul Schreiber, founding dean of the Louis M. Rabinowitz School of Social Work at Hunter College. 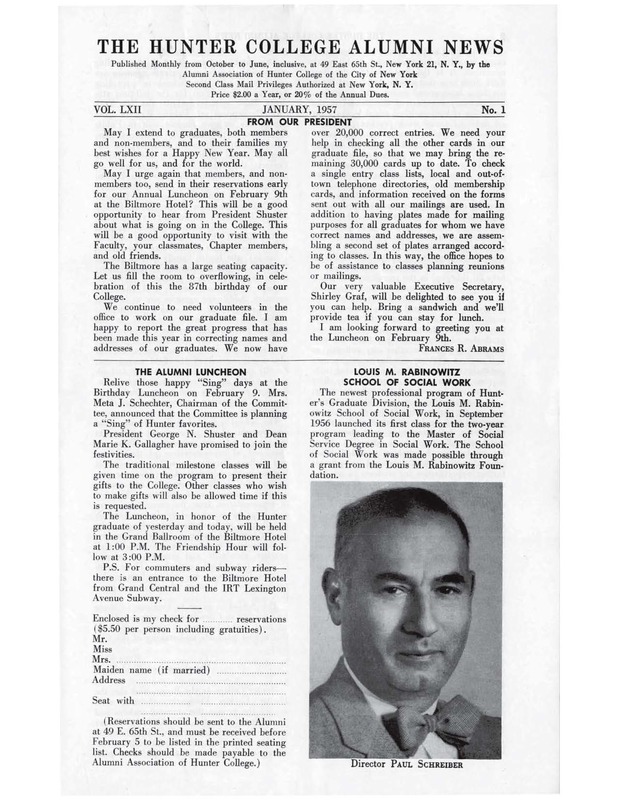 In early 1956, garment industry giant and philanthropist Louis M. Rabinowitz (b. 1887 – d. 1957) gave the Board of Higher Education of the City of New York – now the Board of Trustees, overseeing the City University of New York (CUNY) – a generous gift, enabling it to create New York’s first public graduate school of social work. The Louis M. Rabinowitz School of Social Work officially opened that autumn within Hunter College, now the City University’s largest senior college. It provided an affordable, community-focused social work education from the very beginning. The Rabinowitz School offered a two-year Master of Social Work (MSW) degree program for $600. This made it available to New Yorkers who ordinarily could not have afforded a professional degree. It enrolled 16 part-time and 22 full-time students during its first year – the majority of whom had obtained undergraduate degrees at the city’s public colleges – along with three professors. Exactly as they do today, students spent two days per week in classes and three days placed at social service agencies around the city, through a field education program stewarded by Reva Fine Holtzman. The array of public organizations that partnered with the Rabinowitz School to mentor its students included the New York City Department of Public Welfare; the Brooklyn Bureau of Social Services; the Catholic Charities; and the social service departments of leading city hospitals. On May 15, 1958, in light of such success, the school received formal accreditation from the Council on Social Work Education. The opening of this School is a significant event for Hunter College and social work education. It is the first time in the New York State area that a School of Social Work has been inaugurated under public auspices. The primary function of the School is the education of well-qualified social workers for all fields of social work practice; but as a School under public sponsorship it recognizes within its overall objective a special responsibility towards the public services. The School’s goal is to educate individuals who will be grounded in sound social work practice and ready to assume the responsibilities of the profession. Dr. Paul Schreiber (b. 1924 – d. 1976) was the school’s founding dean, serving from 1956 until 1970. Schreiber came to the United States in the early 1940s as a European Jewish refugee. He escaped Central Europe, where he had been a highly educated and established lawyer, just weeks before that region’s borders were closed to emigrants. Instead of pursuing law in America, Schreiber became a social worker, engaged mainly with the field’s macro practice areas such as social policy. He earned his MSW, taught, and was appointed dean of the Adelphi University School of Social Work before Hunter College invited him to lead its new school. Dr. Schreiber led the Hunter College School of Social Work for nearly 15 years in total, and is widely remembered for his intellectual seriousness and his careful stewardship of a true educational community. In the early 1960s, during Dean Schreiber’s tenure, the school dropped its named recognition of Rabinowitz, and officially became the Hunter College School of Social Work (HCSSW). It also began a major period of transition. The Silbermans’ vision for the school was clear. It would offer the highest possible quality of social work education, at the lowest possible tuition cost, to the greatest number and diversity of students possible; it would remain affordable and diverse permanently; and it would remain intentionally connected with the social needs and opportunities of its home environment, New York City. The Hunter College School of Social Work championed and raised the level of social impact its proponents had anticipated, once it moved into its large, modern facility on the Silberman family site in 1967. Enrollment increased from 75 students in 1964 to around 300 students in 1968. The growing student body also came to more closely reflect the city it served, as Hunter recruited more traditionally under-represented students from within New York’s public university system and beyond. It enhanced its reach and became a place where many students who were personally impacted by the world of social welfare could impact that world in return. The increased size and, particularly, broader diversity of the student body were fundamental to the School’s identity as it entered the 1970s. In 1970, the Hunter College School of Social Work welcomed its second dean, Dr. Harold Lewis (b. 1920 – d. 2003). Lewis was an influential educator and leader, who crystallized the school’s reputation as a prolific institution with a public purpose. Throughout the 1970s, he brought to life several programs that set new standards for American social work education. He introduced a rigorous doctoral program in 1973, the first ever to be offered at a CUNY professional school; developed the first “concentrations” model in an American MSW curriculum; launched post-master’s certificate programs in clinical practice and social work administration, forbearers of the school’s leading Continuing Education programs; and launched the nation’s first work-study MSW program, known as the One-Year Residency (OYR), providing a workplace-integrated master’s degree pathway for professional social service workers who were not able to go to school full-time. These and other initiatives that Hunter pioneered under Dean Lewis became integral to the identity of the school – and to social work pedagogy at schools nationwide. A version of the concentrations system developed here, in fact, became a requisite for any graduate program’s accreditation. The 1970s were particularly important in the school’s ongoing efforts to engage and respond to the changing social needs of New York communities. Urban neighborhoods and their public institutions across the United States continued to face the effects of segregation, disinvestment, and discrimination – many of those effects worsening, despite historic gains. Hunter social work students and faculty were at the front lines of fighting such persistent, systemic inequality, and striving to support the populations most affected by it. In response to community activism within the school and across the city, HCSSW enhanced its capacity to educate social workers for practice amid – and in service to – social change. Among many examples, the OYR program was a crucial initiative to that end, bringing the practice of inclusive social work into the structure of the school itself. It was inaugurated in 1971-72 to address the reality that outstanding social service workers, especially women and members of marginalized groups, often did not have the opportunities or the means to earn master’s degrees while employed. Designed around an innovative partnership between school and employer, the program allows professionals to complete a rigorous MSW curriculum while they continue to work. To this day, its special 27-month timeline and yearlong fieldwork “residency” (based where the student already works) make the OYR an extraordinary engine of career mobility for New York’s social service workers. In the 1980s, the Hunter College School of Social Work underwent its first physical expansion since the 1967 move. The Silberman family added three floors to its 79th Street building, which included significant additions of classroom space and an entire floor devoted to computer-based teaching and online earning. From this new space, faculty members could teach students in the room along with up to five remote cohorts in locations across the region – or anywhere in the world. Social service professionals could attend lectures, participate in discussions, and complete trainings led by Hunter social work faculty while sitting at their office desks. The computer center, along with the introduction of post-master’s course offerings, served as a foundation of the school’s growing Continuing Education initiatives; and it set a model for “distance learning,” which has since connected Hunter students, faculty and staff with partners in communities across the globe. HCSSW faculty, students, and staff continued to place New York’s social changes and challenges at the center of their work in the 1980s. This period was particularly shaped by the HIV/AIDS epidemic, which compounded pervasive racial and social inequities citywide and devastated many already-vulnerable groups. The situation amplified a school-wide conversation, begun in the ‘70s, about the importance of structuring social services more thoroughly around the living communities they serve. The school built out its relationships with community-based health and mental health care providers; worked to understand and teach the unique needs of people living with, or at risk for, HIV/AIDS and other stigmatized conditions; invested in the professional growth of child welfare line workers; and established the Education Center for Community Organizing (ECCO). The school’s core curricular areas, known as Practice Methods – Case Work; Group Work (now incorporated into one method as Clinical Practice); Community Organizing; and Administration (now known as Organizational Management and Leadership) – each grew stronger and more broadly responsive during this period as well, through new faculty hires, unique partnerships, and grant-funded research projects. During the 1990s, the Hunter College School of Social Work continued to lead schools of social work nationwide in shaping a modern paradigm for social work education while upholding its unique character and achievements. The school again increased its student body – reaching 600 students by 1996 – with an emphasis on recruiting the most diverse and outstanding classes possible. The faculty grew as well, both widening and deepening the learning opportunities available to students; and it proudly welcomed greater numbers of faculty members of color, including the school’s first African-American dean, Bogart Leashore (tenure 1991-2003). HCSSW’s research activity evolved to reflect this diversity and dynamism among its students and faculty during this period. In 1995 alone, more than 25 grant-funded research projects were based at the school – including the National Resource Center for Foster Care and Permanency Planning, which was funded for a total of 20 years in a cooperative agreement with the U.S. Department of Health and Human Services, Children’s Bureau. Grant-based projects received support from nearly a dozen government offices and several prominent foundations; and their activities were published, along with research from all over the world, in several leading journals edited by Hunter College School of Social Work faculty. New journals such as the Journal of Multicultural Social Work  – edited by Professor Paul Keys and published by Hunter in 1990 as the first peer-reviewed academic journal of its kind  – helped to permanently impact the direction of social work thought and practice. Since Samuel Silberman’s passing in 2000, Lois Silberman has continued to look after the progress of the Hunter College School of Social Work. In 2001, Hunter College came under the leadership of its current president, Jennifer J. Raab. All Hunter College schools, including the School of Social Work, experienced significant advancement. By 2008, the school was celebrating half a century of success; and, as it enjoyed this milestone, it began looking ahead to its future. In 2008, Hunter College President Jennifer J. Raab came together with the Silberman family, the New York Community Trust, and the City University of New York to announce an extraordinary development. The Silberman family would sell their valuable 79th Street property, where the School of Social Work stood, to a major New York developer – and donate the sale proceeds back to the school. $40 million, at the time the largest single gift ever given to CUNY, went toward the construction of a new Hunter College School of Social Work campus in East Harlem where the school stands today. The remaining $25 million went into a fund for student scholarships, adding to the fund that the Silbermans had established 40 years prior. President Rabb and Hunter College acknowledged this unprecedented generosity by renaming HCSSW the Lois V. and Samuel J. Silberman School of Social Work at Hunter College. The Silberman School of Social Work at Hunter College (SSSW) welcomed students to its new home at 119th Street and Third Avenue in the Fall of 2011. In this space, it encompasses 142,000 square feet across 8 floors, and draws upon numerous unique resources that underline its tradition of public social engagement. These include an expansive library housing one of the finest social work collections in the country; the library and archives of CENTRO, Center for Puerto Rican Studies at Hunter College; the Hunter East Harlem Gallery, a free, public gallery space with strong ties to local communities; the Brookdale Center for Healthy Aging at Hunter College; and five recognized social welfare research centers. The move to East Harlem also represented the school’s renewed commitment to social work education, research, practice, and service in New York City communities where need – and opportunity – is great. Outside its building, the SSSW and its East Harlem neighbors share with one another a fundamental interest in locally-based, widely-reaching social change. Hundreds of SSSW students now attend field placements in East Harlem, and many come from the neighborhood themselves. Students and faculty have developed meaningful relationships with area residents and social service organizations to advance their mutual goals, through field practicum placements and other forms of collaboration. These partnerships, with such groups as the Union Settlement, the East Harlem Neighborhood-Based Alliance Corporation, and the East Harlem Anti-Displacement Taskforce, among many others, exemplify the dual pillars of Hunter’s social work praxis: social-scientific inquiry and direct community support. Today, the Silberman School of Social Work enrolls more than 1,200 master’s-level students, over 75 PhD students (with the CUNY Graduate Center), and students in the School’s new Bachelor of Social Work (BSW) program with Hunter College – all of whom study under a distinguished full-time faculty of 48 and leading field practice educators. The SSSW offers master’s students two primary pathways to the MSW: the traditional two-year full-time pathway; and the One-Year Residency (OYR) work-study pathway for students with social service work experience and the agreement of their employer. Qualified students also may take advantage of advanced standing and accelerated programs. Students pursuing either MSW pathway must select one of three major practice methods that will ground their education and professional lives: Clinical Practice; Community Organizing, Planning, and Development (COP&D); or Organizational Management and Leadership (OML). They may also choose from four available field of practice specializations. The SSSW also offers cutting-edge dual degree programs. For more information, please spend time exploring our Academics and Admissions pages. Looking forward, the Silberman School of Social Work at Hunter College has much to anticipate, including new academic opportunities, deeper links to local and global populations, the growth of the BSW program, and continued technological innovation. All the while, it will be guided by the core tenets of its history so far: Outstanding academic programs on-campus that make an impact off-campus; an authentically diverse school environment; and an unwavering dedication to the people, communities, and social worlds that make New York great. Fine, Reva (1957). “Louis M. Rabinowitz School of Social Work,” in The Hunter College Alumni News 62 (1): 1-2. Author unspecified. “Hunter School Accredited.” The New York Times. May 15, 1958. http://query.nytimes.com/mem/archive-free/pdf?res=9400E0DD163AE433A25756C1A9639C946992D6CF. Fine, Reva (1957). “Louis M. Rabinowitz School of Social Work,” in The Hunter College Alumni News 62 (1): 2. Kurzman, Paul, interviewee. Matthew Goldman interviewer. April 14, 2016 and April 27, 2016. New York. Pace, Eric. “S. J. Silberman, 84, Executive and New York Philanthropist.” The New York Times. February 7, 2000. http://www.nytimes.com/2000/02/07/nyregion/s-j-silberman-84-executive-and-new-york-philanthropist.html. Author unspecified. “Cigar Man Gives $4 Million to City.” The New York Times. September 24, 1964. http://www.nytimes.com/1964/09/24/cigar-man-gives-4-million-to-city.html?_r=0. Author unspecified. “Partnership in Higher Education.” The New York Times. September 26, 1964. Schreiber, Paul (1964a). “The Hunter College School of Social Work,” in The Hunter Alumni Quarterly Summer 1964: 5-7. Schreiber, Paul (1964b). “Paul Schreiber, Director, School of Social Work,” in The Hunter Alumni Quarterly Fall 1964: 5-6. Caputo, David A. “Paid Notice: Deaths Silberman, Samuel J.” The New York Times. February 1, 2000. http://www.nytimes.com/2000/02/01/classified/paid-notice-deaths-silberman-samuel-j.html. Leashore, Bogart R. “Paid Notice: Deaths Silberman, Samuel J.” The New York Times. February 1, 2000. http://www.nytimes.com/2000/02/01/classified/paid-notice-deaths-silberman-samuel-j.html. Author unspecified. “Dickinson Provides Funds for Hunter Scholarships.” The New York Times. May 22, 1966. http://query.nytimes.com/mem/archive-free/pdf?res=9E01EFD91F3EE43BBC4A51DFB366838D679EDE. Salmon, Robert and Joel Walker (1981). The One-Year Residency: An Alternative Path to the Master’s Degree in Social Work.” Journal of Education for Social Work 17 (1): 21-28. Hunter College (1998). “Milestones of the Hunter College School of Social Work,” in 40th Anniversary Symposium and Reception in Celebration of the Hunter College School of Social Work, event program, April 30, 1998. Haffey, Martha F., interviewee. Matthew Goldman interviewer. March 22, 2017. New York. Paulino, Ana, interviewee. Matthew Goldman interviewer. February 23, 2017. New York. Hunter College (2005). “Introduction – The School and its Uses,” in Hunter College School of Social Work Catalog 2005-2006: 4-5. Hunter College (1996). “Hunter College School of Social Work,” in Hunter College School of Social Work Catalog 1996-1998: 8. Hunter College (1996). “Faculty Activities,” in Hunter College School of Social Work Catalog 1996-1998: 40-41. Now the Journal of Ethnic and Cultural Diversity in Social Work, Taylor & Francis/Routledge. Hunter College (1996). “Student Organizations and Activities,” in Hunter College School of Social Work Catalog 1996-1998: 42-43. Collins, Glenn. “Hunter College School of Social Work to Move.” The New York Times. October 27, 2008. http://www.nytimes.com/2008/10/28/nyregion/28hunter.html. Hunter College (2009). “School to Move to State-of-the-Art Facility, Thanks to $40M Gift,” in Social Work at Hunter Spring 2009: 1.